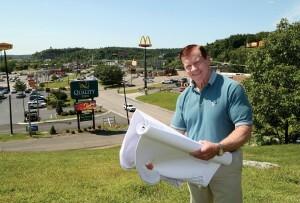 Shale workers keep area hotels filled to capacity. While that’s an economic boost, leaders like Norm Blanchard work to minimize the drawback of potential tourists being turned away. In 2010, Guernsey County’s unemployment rate was 14.7 percent. Thanks to shale development, it tumbled to 5.7 percent by May 2014. That’s all well and good, but the shale-related boom has other implications. “A gas and oil guy from Midland, Texas, came to speak and told us to be prepared for our population to grow from about 11,500 to 100,000 in the next 15 years — at least, that’s what happened in Midland,” said Norm Blanchard, president of the Cambridge-Guernsey County Community Improvement Corporation. “When that hit the newspaper, we got calls. What are we doing to plan for this? How would we handle that kind of growth?” On the flip side, how should the region prepare for when shale development declines? To help, Ohio State University Extension is tapping a $200,000 grant from the Economic Development Administration (EDA) to work with four regional EDA offices representing 25 eastern Ohio counties. Together they are examining shale’s economic, social and environmental impacts and developing plans for sustainable development. gathering and analyzing volumes of data to track the area’s economic, social and environmental conditions, including measurements on employment, population, income, charitable giving, school enrollment, crime, housing, noise, traffic counts, air quality, and water quantity and quality. examining the growth and contraction of specific industry segments. This will allow targeted actions to help local businesses adjust when the active shale construction phase ends. identifying sectors that need local investment. In some areas, the focus might be on infrastructure; others might zero in on housing, community amenities, entrepreneurship or workforce training. working with regional EDA offices to foster long-term planning across community and county lines. piloting educational materials in Guernsey County, thanks to another $20,000 grant. Community leaders across the Midwest will be able to use the materials to incorporate shale development into their strategic planning. Posted by Martha Filipic at 7:57pm January 16, 2015 Posted in Advancing new technologies and products, Protecting water and the environment, Strengthening families and communities, Uncategorized and tagged economic development, shale, shale development, southeastern Ohio. Bookmark the permalink.